ComStat provides Microsoft Office 365 sales, training, and computer repairs and services in North Wales and Chester, including Denbigh, Mold, and Ruthin. Get support for Office 365 and Exchange Email, protect domain name registrations, web site commerce, and email traffic with ComStat’s Internet services. ComStat is a Microsoft Cloud Partner and a member of the Microsoft Partner Network. This means we are authorised to provide delegated support for Office 365 tenancies. Our consultants also hold accreditations ranging from formal teaching and training credentials to Cisco networking certification and more. ComStat’s premium services provide resiliency that standard wholesale and retail products do not provide for. Click through the topics below to find out more about our tools for providing assured delivery of services to small business. Click through our sections below to find out more about the services we support. Secure and manage employee mobile devices like iPhones, iPads, Androids, and Windows phones. Today, computer networks extend beyond the scope of office workgroups. Businesses enjoy the benefits of distributing data to employees’ mobile devices (BYOD), but ensuring your organization complies with data protection laws and protecting against data leakage and loss of customer information poses new issues. We can provide an inventory of all enrolled devices that connect to your organization, create and manage device security policies, remotely wipe a device, and view detailed device reports. Please contact us for advice. Azure, Microsoft’s Cloud platform, provides infrastructure, data services, developer platforms which, combined with Enterprise Mobility Suite, to enable businesses to build end to end products at a fraction of the cost of conventional methods. Amazon’s AWS provides infrastructure services, but it does not provide apps (SSAS), developer, or mobility tools for end to end solutions, for instance. The Weather Channel, F1, and Jet are just three examples of how businesses use Azure to develop their strategic services entirely in the Cloud. ComStat helps users share information across cross platform devices and services, including Android, iOS, and Windows. As more businesses rely on employees using their own devices (BYOD) to connect to business information, securitization of data to protect a business’ customers is an increasingly looming issue. ComStat offers strategic planning and implementation to integrate social networking tools like Facebook, Twitter, Yammer, YouTube and more into business IT solutions. DocuSign is a globally trusted service for electronic signatures and approvals enabling electronic, signature and document transmission from desktop and mobile devices. DocuSign works with the services, applications, and devices including Microsoft, Salesforce, Google, Apple and more. Evernote is a cross-platform cloud app designed for note taking, organizing, and archiving. The app allows users to share “notes” which can be a formatted text, a full webpage or webpage excerpts, a photographs, a voice memos, or a handwritten “ink” notes. The application integrates with browsers like Chrome and Firefox with clipping tools. The app helps users with solutions for displaying flight boarding cards at a personal level to public and private shared notebooks which are widely used in Education. ** Proactive management includes installation of our dedicated server backup software where we will take regular daily backups of your environment and at cost restore the most recent complete and viable set. When assured domain name renewals are important to you, protect your critical email and web services with ComStat’s Guaranteed Renewal facility, which offers continuity of service for periods of up to 10 years. 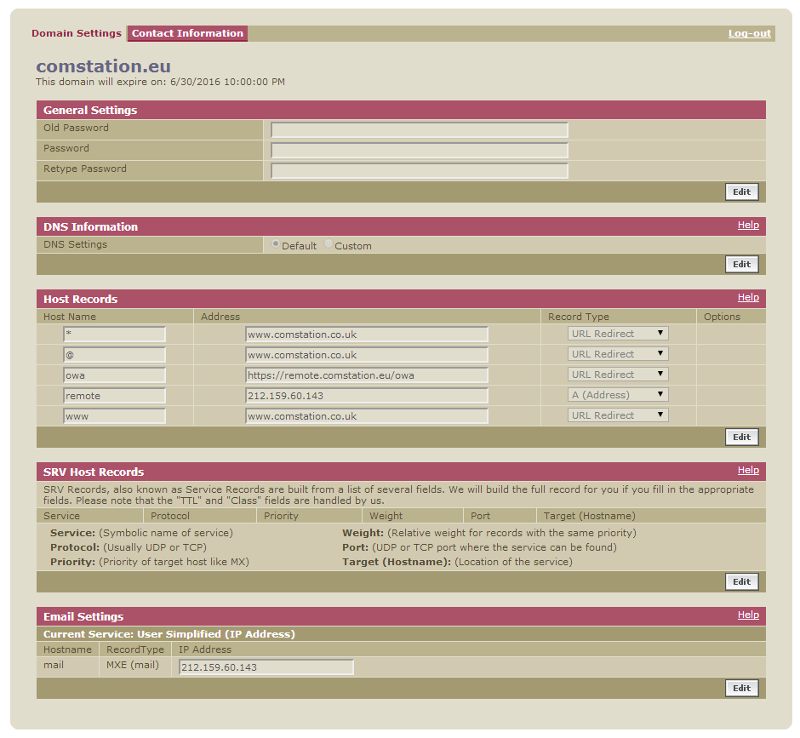 With access to Comstat’s network of registrar agencies (Enom, GoDaddy, Joker, OpenSRS, and more), organizations and users can depend on continuity of service for online orders and critical business email delivery without the risk of service interruption and consequential service restoration costs following missed or late payments for conventional domain name renewals. Organizations need to handle email MX records, network and IP connectivity, and web site services which often require multiple project managers. The problem is, retail services only allow one person direct access to domain names to handle zone records. Please contact us for more information to enable this premium service. Anyone, anywhere can search the public Whois database through any search engine and many other web sites. ComStat ID Protect provides proxy information instead of your personal contact information. Parties who want to contact you use the proxy information, and we forward to you. ID protect can be organised on an individual domain name or portfolio basis. Please contact us for more information about this premium service. Please contact us for more information about this premium service. Web site owners only think about security after their site gets hacked and blacklisted by search engines like Google. Please contact us for more information about our network reporting services.